I would likely have never become interested in dragonflies but for digital photography. Yes, odes are colorful and intriguing in their own right; they can fly and sometimes migrate; they can be an identification challenge; and they are 'manageable' to learn (only 110 species in California) in a way that, say, beetles are not. But they are also small and often moving, and seeing details can require either (a) catching them or (b) photographing them. The ability to take photos and see details instantly through digital photography was the single element that, for me, changed them from slightly intriguing to a mild obsession. While digital photography is a wonderful personal tool, my snaps don't add much for the broader audience. 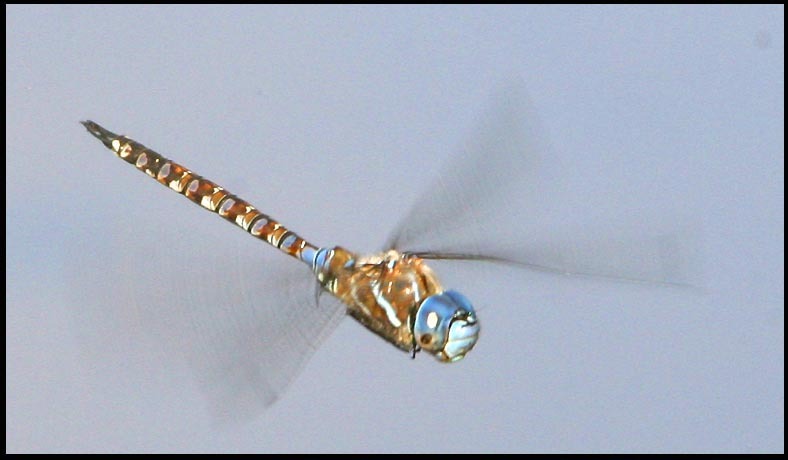 With the exceptional dragonfly photography of Ray Bruun, Greg Lasley, and Eric Preston on the web (to name just three of a dozen or more great odonata web pages), nearly all western North American odonates are already very well represented in stunning color photos. So, to the extent possible, I've been working on shooting dragonflies in flight. There are comparatively few flight shots of even common California species currently on the 'net. Here is a head-on flight shot of a Blue-eyed Darner (right). What I particularly like about this shot is that the depth of field was great enough to see both the face and the terminal appendages in some detail. I've been trying a technique suggested by Paul Johnson [the Lavender Hill Man]. All my early flight shots used the automatic features of the Canon D10 to pick speed and exposure. This often resulted in a fast shutter speed and a low f-stop (e.g., 1/1000 at f5.6). This choice may stop the wings but results in a very shallow depth of field. More recently, I've been doing a lot of shooting at manual exposures (e.g., 1/250 at f11 for the same subject). This gives a much better depth of field but the wings become a blur. Here is a profile shot of the same Blue-eyed Darner (below) and then, below it, a shot of Paddle-tailed Darner from Alpine County using the 'automatic' exposure feature. 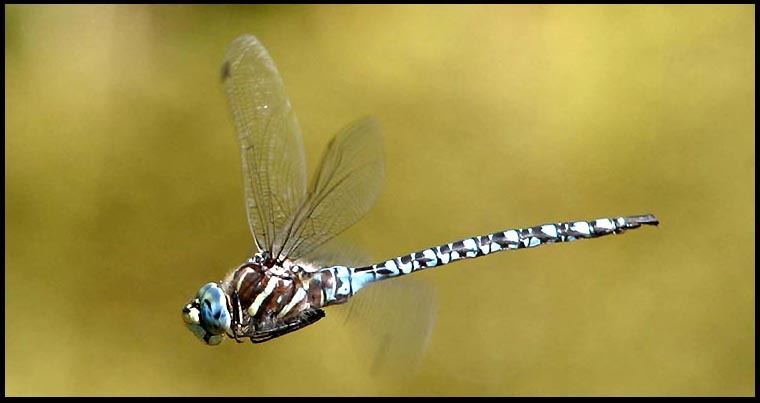 Note that the fast shutter sped on the Paddle-tailed Darner does 'stop' the wings in mid-stroke, and allows study of, say, the pterostigma. But everything is a trade-off. I generally prefer the option that permits more depth of field, and it also gives the illusion of motion (the moving wings), The depth of field shows a broader range of details, but those shown may not be a crisp as the faster shutter speed. All the flight shots require manual focus. The automatic focus feature is too slow and inefficient on these small and fast subjects. Manual focus on a flying dragonfly is very tough — and one shoots a lot of shots to get anything decent at all. Fortunately, digital photography permits one to throw away all the bad photos at no cost. The other thing I try to get in photos of flying dragons is a uniform background that complements the subject. Both the Blue-eyed and Paddle-tailed Darners were shot while they were in flight over water — and that does provide a fine background composition. While various mosaic darners do sometimes hover over water, permitting attempts at flight photography, I've had a bit more trouble with Common Green Darner (right & below). There was a male at Laguna Grande park in Seaside, Monterey County (right), that often briefly stopped at the same spot — and I've pointed the camera at him a bunch of times with only okay success so far. When the legs are tucked in, they look like a black belly patch. Darners — and spiketails, cruisers, emeralds, gliders, and saddlebags — seem always to be in flight, so flight photography is often the only choice during a day's outing. Not so with the damselflies that sit around for portraits, if you have a macro lens. So far my flight shots of them — like the Boreal Bluet below — are marginal. 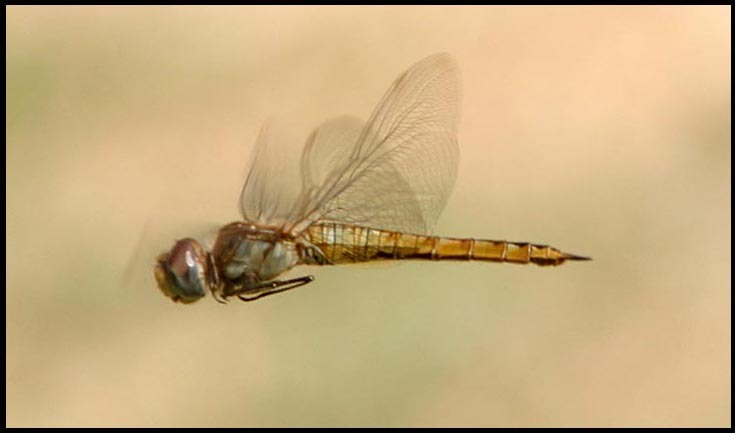 But perhaps it partially illustrates one of the most amazing features of Odonata: each wing is independently operated — the only four-winged critter on earth of have that ability. Finally, I was surprised to find that my effort at flight photography of Wandering Glider (above) ended up looking like one of Kathy Biggs's scans! But it actually is a glider in foraging flight, with its legs tucked up to reduce drag. Almost surrealistic . . .